The Orris Root plant is Iris Germanica florentina, it is well known as the plant that produces the Orris root powder. It has been used in herbal medicines and perfumes for many years. Today Orris root powder is used in cosmetics, perfumes as well as potpourri. The root is dried and ground to a powder for these purposes. The plant itself is sometimes simply called the Florentine iris, and it is common in southern Europe through to Northern India. The flower itself is attractive white with to purple in the falls. The leaves are typically fan shaped from a rhizome that grows slightly exposed to the light. Reaching a height of around 60 cm and slowly spreading to form a clump, this is an easy to grow plant. 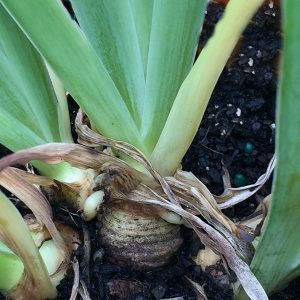 Orris Root plant or Iris Germanica florentina grows best in a sunny position in a well drained humus rich soil. Best in climates that have dry summers, and better in a cool position in very hot climates, some afternoon shade may be best. Avoid excessive use of fertilisers, and avoid heavy clay soils. If using the plants for herbal or cosmetic purposes they will take around 3 – 4 years to get to a good useable size. When harvested the root will take 4 – 6 years of drying to reach its highest level of fragrance. Iris Germanica florentina is simply the white flowering variety of Iris germanica. This is an early flowering iris, and its short stature lends it to growing near the front of the garden border.